In 1832 the Parliament of the United Kingdom passed the Anatomy Act, legalising the practice of doctors, anatomists and medical students dissecting any body that went unclaimed upon death. With this new law the medical community would no longer need to satisfy its ever-increasing demand for corpses by paying professional body snatchers – or ‘resurrection men’ – to dig up the freshly dead, and the highly lucrative market for dead bodies would be brought to an end. But the act was none the less hugely controversial. The kind of people who died in hospitals and whose bodies went unclaimed by friends or family were almost always the very poorest of the poor. Futhermore the act also gave doctors access to the bodies of society’s most destitute and desperate of all, those that died in workhouses. Those without a loved one to claim their body upon death would be no better than the convicted criminals that had previously provided doctors with their only legitimate access to a fresh corpse. What the Museum of London’s new exhibition Doctors, Dissection and Resurrection Men does brilliantly is show how the ethical dilemma that confronted early 19th century society lingers on to this day, and how we are still living with the consequences of the Anatomy Act (a law that was only replaced in the 1990s with the Human Tissue Act). The part of the gallery where you are invited to sit and listen to a reenactment of the parliamentary debates that took place at the time of the act is particularly good, as is the conclusion of the exhibition containing a 200-year timeline showing the changes to the law, to medical science and to society as a whole since 1832. In this room there are also video interviews with members of the public talking about their thoughts on organ donation, and even a notice board where visitors are encouraged to scribble down their opinions on the matter. The simple fact is that, 170 years after the Anatomy Act, the medical profession’s demand for bodies still way outnumbers supply, and while this remains the case questions like whether to introduce an opt-out system of organ donation instead of an opt-in system will not go away. Another way in which the exhibition links the past and the present very well is with its collection of skeletons recently found during building work at the Royal London Hospital in Whitechapel. 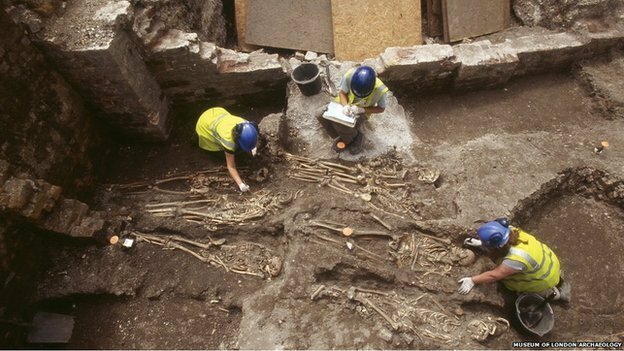 Until 2006, when some 260 bodies in total were unearthed, the suspicion that many had had about the hospital illegally dissecting bodies (before the Anatomy Act had been passed) and then secretly burying them in its grounds had never been proved. The improvised burial ground, built over in the Victorian period, began as an orderly line of coffins, but very quickly grew into something far more haphazard. Many of the bodies were found piled on top of oneanother, resembling victims of a massacre or genocide. The gallery wall contains plenty of fascinating photographs of the excavation as it unfolded. Meanwhile the skeletons themselves lay there, in a line, gazing up at us, many with their skulls cut open or drilled through, all showing some kind of scar from the instrument of a surgeon. I found it rather unsettling the fact that each of these skeletons was once a living, breathing person who, through whatever circumstances, had no friend or family to claim their body when they died. There is almost certainly a tragic tale of poverty, destitution or the nightmarish daily toil of the workhouse behind each and every one of them. A tale that would end with the final indignity of having their remains cut up in an anatomy class and then dumped in a makeshift grave. 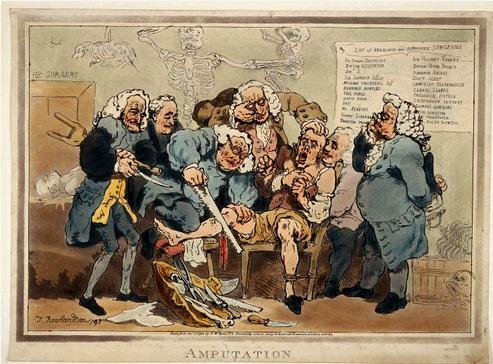 ‘The Amputation’ by Thomas Rowlandson, 1785 (from the Old Operating Theatre Museum Website). Even more unsettling than these poor skeletons was the section of the exhibition all about early nineteenth century surgery. These were the days before germ theory and antiseptic, before antibiotics, and most horrifying of all to my 21st-century sensibilities – no anesthetic. The great many surgery instruments on display here, including several amputation saws, go some way to evoking the unimaginable terror of an amputation. A book from the period open at a page listing a week’s worth of amputations – the patient’s name and age, the surgeon, and the eventual outcome – illustrates just how lucky one was if they survived such an operation (even if massive blood loss didn’t kill you, there was a chance you could die from shock!). Fortunately for my rather squeamish self, there was very little gory imagery in this section, and in the exhibition generally. Thomas Rowlandson’s rather comic depiction of a leg amputation from 1785 was quite enough for me to stomach! 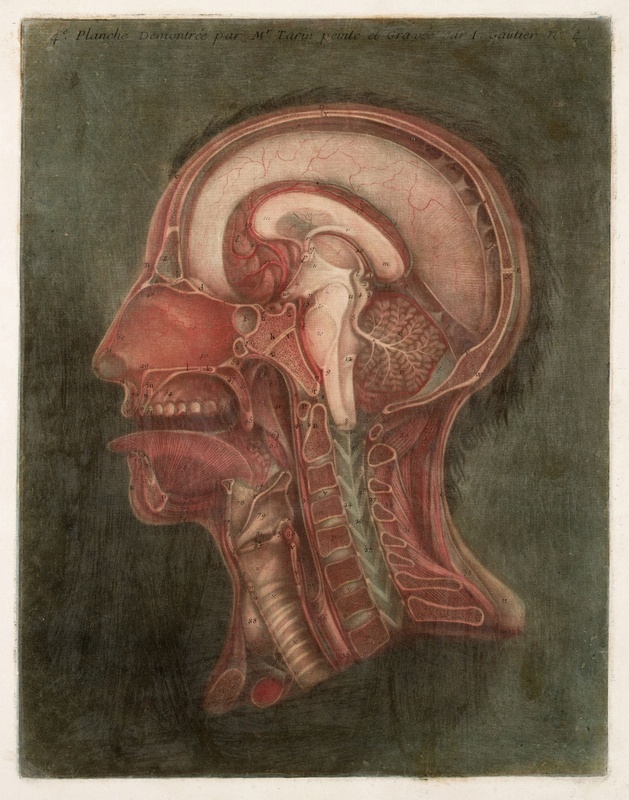 While this all serves as a useful reminder of just how much medical science has advanced over the past two centuries or so, the collection of highly detailed anatomical drawings and models from the time do illustrate that knowledge of the structure and inner workings of the human body was already highly developed by the early nineteenth century. In this way, I think this part of the exhibition serves to demonstrate to us not only that the considerable progress made by medical science since the early 19th century could not have come about without the acquisition of human corpses for research, but perhaps more importantly, it also shows how advances in medical science that took place before the time of the Anatomy Act could not have come about without the practice of body snatching. To put it another way, however simple or crude the practice of medicine and surgery back then may seem to us, it was still treating people and still saving lives, and the doctors owed their extensive knowledge and skills at least in part to the resurrection men. Baring this in mind, perhaps we can partly forgive the medical men who broke the law and gave money to men who supplied them with corpses, knowing full well that many had been stolen from cemeteries. The men who did the dirty work, however, digging up corpses in the dead of night, were only in it for the money, and once the financial incentives were high enough some even resorted to murder in order to get their hands on a corpse. Indeed the conviction of John Bishop, Thomas Williams and James May of the murder and subsequent attempt to sell the body of a 14-year-old Italian boy in 1831 was one of the highly publicised incidents that brought about the passing of the Anatomy Act (one of the others being the conviction of the notorious Burke and Hare in Edinburgh in 1829, after which Bishop, Williams and May were labelled the London ‘Burkers’). Difficult as it is to feel anything but revulsion for men like this – whatever their contribution on the advancement of medical science – there is a macabre humour about the way one resurrection man describes, in a dairy that can be read in-depth on a digital display in the exhibition, attempts to rob graves being thwarted by angry dogs or a lack of moonlight. There is a very funny moment when he decides against it altogether on one particular night after getting a little too drunk at the pub. Other contemporary texts such as newspapers make up the bulk of the objects in this section, but two particularly chilling artefacts really bring the very real fears people had about having their own bodies dug up by resurrection men to life. A cast-iron coffin, almost rusted away to nothing but still showing the marks made by long nails hammered into the metal to hold the lid into place and prevent it being lifted off with a crowbar, and a sinister-looking man-trap, a tried and tested means of both deterring and catching a grave robber. Those that couldn’t afford luxuries like these would instead simply watch over their loved ones’ bodies night after night in the cemetery. There is of course a glaring irony in the fact that, in some extreme cases at least, it was premeditated murder that facilitated a supply of corpses to the medical profession that, in turn, led to the advancement of medical science and ultimately to the saving of lives. It goes to show that the history of medicine needed not just heroes but a few villains along the way to give us the knowledge and intricate understanding of the human body that we have today. It also demonstrates that this knowledge must never be taken for granted, and asks those of us who feel uneasy about donating our bodies or bits of our bodies to medical science to perhaps think again about how valuable our contribution may be to society as a whole. However much we may dislike the idea of our bodies being chopped up, examined and experimented on after we die, or the idea that our bodies are somehow owned by the state, I’m sure none of us would want to pay a visit to a hospital from the early nineteenth century next time we are seriously ill or have an accident. Doctors, Dissection and Resurrection Men runs at the Museum of London (London Wall, near Barbican station) until 14th April 2013. Tickets are priced at £9 for adults. Tags: amputation, Anatomist, Anatomy, Anatomy Act, archeology, bodies, Bodysnatching, Burke and Hare, burkers, corpses, Dissection, Doctors, exhibition reviews london, exhibitions london, France, History of Medicine, hospital, Human Tissue Act, James May, Jaques-Fabien Gautier, John Bishop, London, Museum of London, parliament, Resurrection Men, science, skeletons, surgery, Thomas Rowlandson, Thomas Williams, Victorian, workhouse. Bookmark the permalink. Very interesting post. I think that when 3D Bio-Printing is in full swing (about 20-30 years from now) the problem of finding cadavers will be solved The medical profession can just print them when needed.